Free Shipping Included! 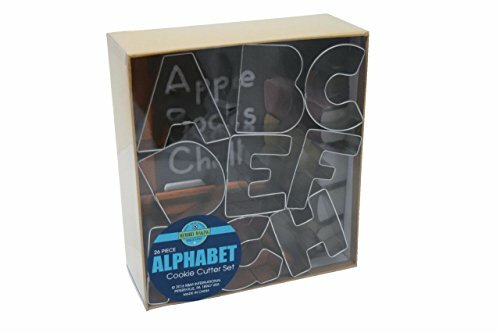 R&M International 1954 Alphabet 3'' Cookie Cutters, 26-Piece Set in Gift Box by R & M International at Seasons Cafe Bakery. MPN: 1954. Hurry! Limited time offer. Offer valid only while supplies last. Have even more fun making your favorite cookies for holidays, parties and other special occasions with these Cookie Cutters from R&M International. View More In Cookie Cutters. High-quality cutters cut through a variety of doughs easily and can also be used on sandwiches, fondant or craft clay - don't limit your imagination! R&M has a variety of cookie cutters for every occasion - we look forward to being part of your baking and celebrations! If you have any questions about this product by R & M International, contact us by completing and submitting the form below. If you are looking for a specif part number, please include it with your message.